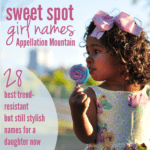 Choosing names has always come easy for us. We named our son about ten minutes after the ultrasound tech declared, “it’s a boy.” Our daughter was down to two or three favorites, but we agreed right after she was born. Their full names are Ethan Edward and Tessa “Tess” Marie. Edward and Marie are family names that happen to be kind-of-sort on both sides of our families. Our last name is a presidential surname that starts with C and ends with -er. We are now expecting twins – a boy and a girl. They will complete our family. We have a name picked out for our son: Levi Andrew. But for a daughter, we’re stuck. Because our last name is a popular first name, we don’t want to use anything like Madison that would lead to confusion. I don’t like alliteration. Tessa was almost Clara, but I decided Clara C. sounded too cartoon-character to me. 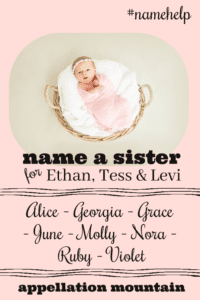 We would prefer to avoid repeating initials, so no more names that begin with E, T, or L.
Nicknames are okay when they’re obvious, like Tess for Tessa. Neither of us is very adventurous. We’re not going to have a kid named Blue Ivy or anything like that. 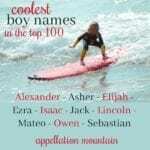 But we do know a lot of kids at this point, and names like Olivia, Isabella, Evelyn, and Emma/Emily and Amelia are probably out because we know more than one, though they are all names that we like. Please read on for my response and share your thoughtful suggestions in the comments. Congrats on your twins! With your new son named, you’re halfway there … now let’s see if we can’t come up some ideas for your daughter. 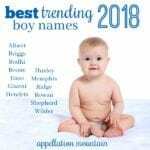 The more kids you name, the tougher it can get to avoid repeating sounds. We’ve ruled out four letters of the alphabet: C for your surname, plus E, T, and L for your other children’s names. That leaves 22 letters, though, so I think we can work with that. Alice – Spare and straightforward, but filled with a mix of storybook innocence and real-world resilience, Alice strikes me as a fitting sister name for Tess. It’s a different initial, too, and while I questioned if Ellie and Alice were too close, I think they pass the test nicely. Georgia – Tessa reads spunky, and so does Georgia. At just two syllables, it doesn’t require a nickname, though Georgie is obvious and available. Grace – Single-syllable names tend to feel nickname-proof. That’s not quite true, but I think Grace/Gracie falls into the same category as Tessa/Tess – it’s a logical, obvious choice, one that your daughter could use or not over the years. June – My first thought was Jane, but maybe June feels a little more like a sister for Ethan, Tessa, and Levi? It’s a fresh choice, upbeat and optimistic. But it also feels traditional, the kind of name that we all recognize, even if we don’t hear it often. Molly – My first suggestion was Lily, but that clashes with Levi. So I substituted Molly instead. In many ways, it’s a traditional name – short for the evergreen Mary. But it’s also casual, a natural sister for Tessa. Nora – Clara always makes me think of Nora. Because it avoids the initials C.C., would Nora suit? Ruby – Ruby introduces a new vowel sound into the mix, and has a different first initial, and is pretty mainstream without being too common. Could Ruby work? Violet – Okay, Levi and Violet might be a little too close. But I like the subtle link with the shared ‘vi’ sound in the two names, so I can’t resist adding it to the list. And I do think Violet meets all of your requirements nicely. Overall, I’m most attracted to June and Grace. I think Junie and Gracie are nicknames in the same way that Tess is for Tessa. And I like the sound of Ethan, Tess, Levi, and June (or Grace) a lot. But I know the community will have some great suggestions … so over to you! What would you name a twin sister for Levi Andrew? Grace and Ruby are perfect. But I’m thinking Isla, Pearl, Hazel, Heidi, Zoe, Stella or Rose. Or, if they like Clara, what about Sara or Zara? I’m leaving out whatever has been suggested already. For something less common, but still not too adventurous – Azalea, Beatrix, Zinnia. I think Georgia, Nora, Ruby, Grace or Molly are spot on. Of those, I think Georgia and Ruby are my faves for you. I love June as well but think the others are slightly better stylistic matches. I like Molly. Polly has the same feel. Or Allison, Annalise, Annika, Belle, Danica, Gillian or Jillian, Hope, Jocelyn, Julia, Mariah, Rosalyn, Victoria. I feel like Abby’s suggestions knocked this one out of the park, and I especially love Georgia and Nora. I also like Iris, Vera, or the more unusual Veda. Maybe Paloma or Ruth. And I know the nickname first thing isn’t your style, but a Betsy (Elizabeth) or Kit (Katherine) sound like a great sister for Tess. Anne – and I’d specifically plan to call her Annie. Annie and Tess?!?! Swoon. Ethan, Tessa, Levi, and Anne. Ruth – with Ruthie as an option. Tess and Ruthie. Ethan, Tessa, Levi, and Ruth. Pippa – ordinarily I prefer long formal names that can be shortened, but I think Philippa, Philomena, etc. would sound odd in this sibset. But I think Pippa would be smashing. Tess and Pip, Tess and Pippa, Tessa and Pippa – all great. Ethan, Tess, Levi, and Pippa. Hattie – I LOVE Harriet and I think it could work in this sibset, but I think Hattie might be an even better fit. Ethan, Tess, Levi, and Hattie. I am also in *love* with the idea of Posy and Josie or Jo. Is Josie a “real” formal name?? Honestly asking – not being snarky at all! Because I love the idea of Ethan, Tess, Levi, and Josie – I think they are perfect together. But Josephine sounds a little long for them. I think Jo would be a sweet nickname for a sister for Tess, as well. Posy also is gorgeous – but again, is it formal? Over all I think I’d go with Hattie as my first option, or I’d consider Josie as a name on its own, if it’s formal enough for them. But I’d be happy with any of these, and with Abby’s suggestions of June and Ruby. And LOVE the suggestions below of Meg or Mae! And Kate/Cate!! I thought Nora right away! Sounds great with sibs and last name! My favorite suggestions are Molly and Nora. I would add Delia, Vera, and Joanna, but my favorite is Nora. Ethan, Tessa, Levi & Nell. Everyone gets their own first initial and ending sound. Plus, everyone has two syllables. Milly might suit you, too. Do love the suggestion of Gemma! Audrey and Hallie are the two I would add… But I love Abby’s suggestions too! I think Georgia would be my fave from Abby’s list. Congratulations!! 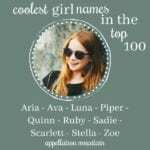 LOVE the suggestions of Daphne, Darcy, Georgia, Juliet, Nina, Noelle, Phoebe, Rose and Simone. I also recommend Daisy, Frances, Maisie, Paige, Valerie and Whitney. Oh, yes. Daisy is a perfect suggestion! What about Maggie? Or Laya or Layla? Congratulations on your two new arrivals!! I came to second Maeve with possible nn Mae. Ethan, Tess, Levi and Mae. 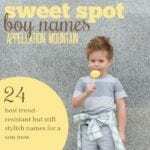 Keeps the two syllable boy name / one syllable girl name pattern and keeps an “e” in all the names. Seems like you like the “e” vowel sound — both the long and the short. Your own name Ellie, is both the long and the short too! “Eee” for Ethan and Levi and Marie. “Eh” for Tess and Edward. So if not Maeve maybe another name with an eh/ay sound? Like Kate as a nn for Kaitlyn? Or Cecily? Tessa and Cecily seem like sister names. I think Grace works here too for the “eh/ay” reason too. Or perhaps Megan nn Meg? Meg is quite spunky. Ethan, Tess, Levi and Meg? I like Nova as a sister for Levi. Nice repetition of the V but they don’t sound the same at all. Nola is another sweet name I think would go nicely with Levi, Tessa, and Ethan. Love the suggestion of Olive. I know a little Tessa who goes by Tess. Her sister is Elise, which repeats the E first letter, but the two names do go nicely together. What was the other name you had on your list for Tessa (besides Clara)? That one doesn’t feel right anymore? I also love soneone else’s suggestion of Nina! From Abby’s suggestions, I think Molly fits best. I love the suggestions of Georgia, Sylvie, and Ada! If alliteration is out, then K would also be stricken from the list. I think from the above list, Nora and Alice address my favorite choices. I know we want to avoid repeating initials but Lydia is so sweet with Tess (and Ethan and Levi). But I’m usually anti twins matching sooo… I’ll second Ruby and Anna. I don’t think June will work, if they’re trying to avoid ‘common’ names. I assume their last name is the same as Jimmy’s, so isn’t June too much like June C____ Cash? Of the ones Abby suggested, I most like Georgia. Georgia and Tessa are adorable together! My favourite is Ada. Ada and Tessa. Levi and Ada. Ethan, Tess, Levi and Ada. Adorable! I didn’t even THINK of that! You’re right … June might not work. I really like June, Nora, Molly and Grace. Love this list! Anna is one of those names we tend to assume is very popular. And I do know a bunch of girls with names like Annabelle. But Anna? I’ve only met one. I think it stands out nicely. I think Naomi suits particularly well — especially because, like Levi, it’s an Old Testament name that ends in “i.” A subtle twin-link! That’s a really good point!